Europe is preparing to visit the innermost, hot and mysterious planet: Mercury — BepiColombo, Europe's first mission to Mercury, is currently being readied at the European Spaceport Kourou (French Guiana) for launch. The spacecraft was built under the industrial leadership of Airbus, leading a consortium of 83 companies from 16 countries, for the European Space Agency (ESA) and Japanese Space Agency (JAXA). The four-in-one spacecraft will set off in October on-board the Arianespace Ariane 5 flight VA245 for its journey to the smallest and least explored rocky planet in our Solar System. The 6.4-meter stacked satellite assembly will be injected into a direct Earth escape trajectory to start a seven year journey toward Mercury. 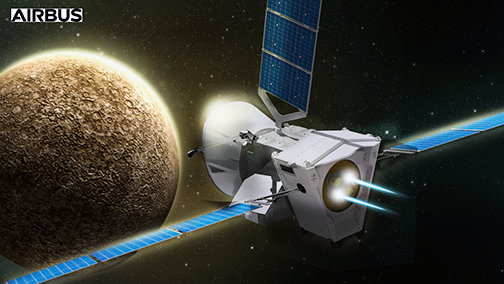 Power sources for BepiColombo will be the gravity of Earth, Venus and Mercury in combination with the thrust provided by solar-electric propulsion (SEP). During the voyage to Mercury, two orbiters, a transfer module, consisting of electric propulsion and traditional chemical thruster units, and a sun-shield will form one single composite spacecraft. When the craft arrives at Mercury in late 2025, the transfer module will separate the two science orbiters. They will endure temperatures in excess of 350°C and gather data during its one year nominal mission, with a possible one-year extension. While final launch preparation activities are ongoing in Kourou, Airbus team members are heavily involved in the LEOP (Launch and Early Orbit Phase) simulation campaign at the European Space Operations Centre (ESOC) in Darmstadt (Germany). A dedicated Project Support Team will be present in ESOC at launch to support the first "steps" of BepiColombo. The Sun’s glare makes it impossible to study Mercury in detail using telescopes and the extreme heat and proximity to the Sun make it hard to reach. So far, only two NASA missions have visited Mercury: Mariner 10 in the 1970’s and Messenger, which orbited the planet from 2011 until it ran out of fuel in April 2015. 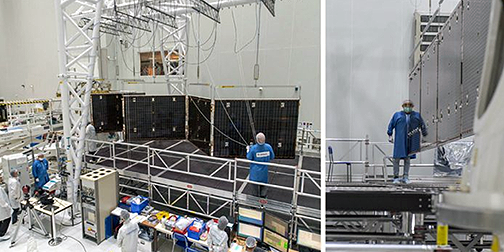 ESA and JAXA have teamed up for the mission BepiColombo. It is made up of two separate orbiters, the Mercury Planetary Orbiter (MPO supplied by ESA) and the Mercury Magnetospheric Orbiter (MMO supplied by JAXA). 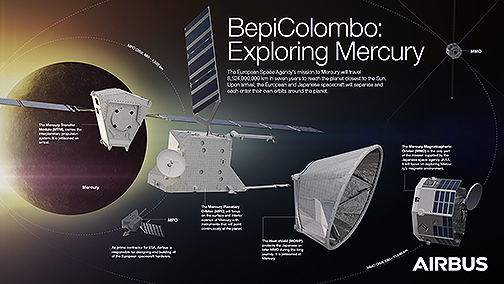 The BepiColombo mission, named after the Italian professor Giuseppe ‘Bepi’ Colombo, who was instrumental in making the Mariner 10 mission such a success, will examine the peculiarities of Mercury´s internal structure and magnetic field generation, and how it interacts with the Sun and solar wind. It will investigate surface features and chemistry, such as the ice in permanently shadowed craters at the poles. The mission's science will significantly improve our understanding of the formation of our Solar System, and the evolution of planets close to their parent stars.